Lev, the bassplayer of Mortal Love, answeared some questions concerning the new album "I have lost..." and some others things, to our editor Nathalie Mohr by e-mail. Hi, thank you for taking time answering some questions. Would you mind to introduce the band to the people who don't know you? Who came up with the idea of your band name? Which meaning does it have for you? We were writing the story and the name Mortal Love came up in the story, and we just looked at each other and said: „That’s us“ „We’re Mortal Love“ It kind of fits the whole story, the band and the concept quite well. Let's come to your new Album „I have lost...“. It's a concept album like the last one „All the Beauty...“. Why did you only record concept albums so far? Because the story is so long. It had to be told over several periods. I think it shines trough more on ATB, than on IHL. Maybe because the songs are attached to each other physically on ATB. It’s another part of the story this time, which covers moods, and losses. 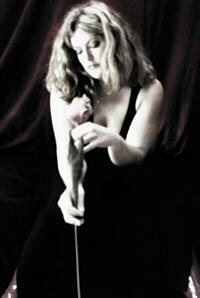 A mind in chaos, and therefore we decided not to link the songs as they covers so different moods. The cover artwork of the album includes – as the last one – a picture of Cat. Do you define the band and the music with her? When you have a good-looking female vocalist, it’s natural for us to use her as a front person. It fits the genre, and I think we kind of make our own signature on our album by using her. It would be wrong to change that now, as it is a sequel. The albums connect pretty close, and I think one have to stay focused on what we have started. The album is a depressive one. Do you like this mood? Which message do you want to bring to the listener? It’s like this for us: When we’re in that kind of mood, we create a lot of art, lyrics, songs and so on. To speak for myself I’m hardly writing anything when I’m happy and without concerns. The story we tell (a true one) is not happy at all, and we have to transform these moods into music and lyrics. I like to think that maybe this is our way to deal with these feelings. As far as the message to the listeners…I hope we can help to understand that you’re not alone with these feelings. As love/hate is a topic most people have experienced at some stage, listeners can relate to the songs, and what we are expressing. Of course. Like I said above, this is a story that we relate to strongly. All in the band have been in equal situations, and therefore there’s always a personal thing behind all this. We make music cause we like it, and the more you relate to your music the more important it becomes to you. Hope this also shines trough on stage. How would you describe your music to an alien? Do you have special idols? For me personally it’s a lot of people. Not only musicians. But I’ll try to give you some: Jeff Buckley, Neil Peart, Jesus Christ (the person) and the people out there who’s trying to make world a better place. Do they influence your music? Hmmmm well the two first ones surely have been important to me musically. The way I think music will never be the same after hearing those guys. For Jesus, I hope that the part of him that treasured honesty has influenced the way I want music to be. How do you handle comparisons with other bands that do a mixture of Gothic and Metal? To be honest I’m not that into Goth/metal myself. I love it when we are compared with bands like: The Gathering, Theatre of Tragedy, Tristania, Lacuna Coil. I like great music whatever label you put on it. A good song is a good song whether it’s Elvis Costello or Dimmu Borgir. I have so many different types of music in my cd shelf, that you wouldn’t believe it. Some of it is crap, but mostly I can take out any cd and find great songs, and great lyrics that I love. Right now I’m waiting for the new “30 Seconds to Mars” album to come out. That is music I just can’t stop listening to. Do you have special memories or connections to any songs (own or others)? Our own songs have to be the depressive “Identity”. I have to pinch myself not to cry on the refrain. It’s such a sad melody in the saddest parts of a persons despair. In some way yes, in others no. I think the most important thing is that you have a sense of goodness to strive on to. My opinion of how to live your life is so to make yourself grow and make the people around you grow with you. If you smile to a person, or just give him/her a positive comment, it means so much to the one in the receiving end, that you wouldn’t believe it. And you didn’t even think about it. So if a good life is a religion…then I’m religious. I read the bible just too ashore myself that I’ve understood the Jesus Christ person right. He was just a good person with the best intentions. I like to think that he was rather a “guide” to how to live life, not a God. I’m also open to the things we cannot explain. Paranormal activities and stuff like that. I would be disappointed if humans were the most intelligent life form in the universe!!! Will there be a promotion-tour? At this stage it’s hard to say either yes or know…so I’ll have to ask you guys to stay tuned to motallove.com for further information during the summertime. To lead a good life, make the greatest album of all times in 2006, and shine for people around me! What's your attitude towards internetmagazines? I think they contribute so much for bands like ML to reach every corner of the world. It’s great, and I surely hope the Magazines in the stores get a great competition…cause they need it. We wouldn’t be known in half the countries we are now; if it wasn’t for the internet and the internet-magazines…so thank you all! fans:….the most important thing a band can have. Never ever try to put yourself in a higher place than a fan. And to all ML fans: YOU ARE THE GREATEST. WE TRULY LOVE YOU ALL…and that’s the truth! dreams: never let anyone ever tell you that you can’t fulfil your dreams. love: most beautiful thing on earth, and worst thing ever, if you can’t have it! I just want to say thank you for the interest in Mortal Love. Our gratitude is huge. 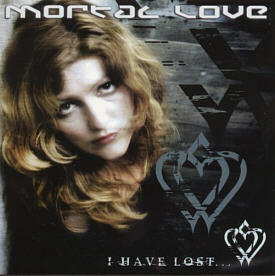 To our fans that still haven’t picked up the “I Have Lost…” cd, buy it, and give us your opinion on http://www.mortallove.com . Feel free to join our forum to discuss ML and other things on your mind.